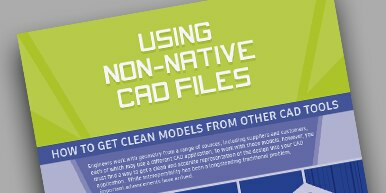 CAD file interoperability has always been a problem for engineers. See how other engineers are overcoming this with flexible and modern approaches. Engineers work with geometry from a range of sources, each may use a different CAD tool. To work with those models, engineers must find a way to get a clean and accurate version of the design into the appropriate CAD application, often opting for modifying with parametric modeling approaches. While interoperability has been a longstanding traditional problem, important advancements have arrived. Fixing broken geometry that comes from other CAD applications represents a significant non-value added activity, distracting engineers from exploring design alternatives and making engineering decisions needed for that quick back-and-forth with suppliers. It is a stark reality today that engineers must be able to modify designs that come from others, whether regardless of the CAD application. Modern technologies, like direct modeling, make this task easier and faster than it has ever been.